What if your favorite vacation hotspot was just outside the door? What if you could enjoy it every day without ever leaving home? Award-winning author and garden designer Scott Cohen shows you how to make this dream a reality in Scott Cohen’s Poolscapes: Refreshing Ideas for the Ultimate Backyard Resort. Whether you’re looking for an intimate hydrotherapy spa, a splash-happy place for family fun, an invigorating exercise pool or an exquisite setting for outdoor entertaining, you’ll discover the secrets behind Cohen’s breathtaking, high-performance swimming pools and spas. Each chapter highlights a project from Cohen’s own portfolio, featuring yards of every size that Cohen and his team have transformed into extraordinary poolscapes. Glistening infinity pools, Tuscan-style fountains, outdoor waterfalls, romantic tropical coves—they’re all here. The book includes many award-winning landscapes that have been featured on Home and Garden Television (HGTV) and in numerous books and magazines. With gorgeous color photography and hundreds of backyard design ideas, Cohen illustrates the tips and techniques that go into a perfect pool landscape…tips you or your designer can use in your own landscaping plan. In addition to swimming pool designs and hot tub ideas, the book covers fountains and other water features; patios and outdoor rooms and landscaping materials including tiles, pavers, and stone. Cohen also demonstrates dazzling nighttime effects using innovative landscape lighting techniques and mesmerizing fire and water features. Homeowners and landscape designers will both find inspiration for stunning backyard pools and spas in Scott Cohen’s Poolscapes. Scott Cohen is an acclaimed garden designer and author whose award-winning work has been showcased frequently on national TV and in numerous books and magazines, including Better Homes and Gardens, Fine Living, Women’s Day, USA Today and The Los Angeles Times. 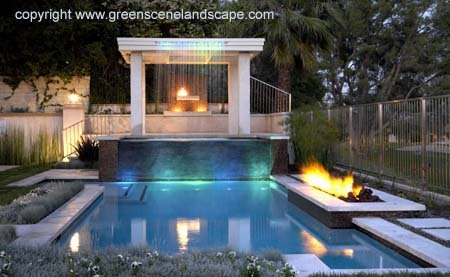 Cohen and his company, The Green Scene, regularly demonstrate their innovative pool and spa techniques on HGTV’s Get Out, Way Out, the Big Splash, and other outdoor design programs. 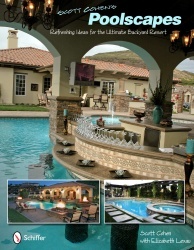 Cohen’s award-winning Outdoor Kitchen Design Workbook offers more design secrets for resort-style backyards. When Garden Artisan Scott Cohen wants to work real magic into his water features, he plays with fire. Best of all, he finds extraordinary ways to combine the two. That’s because Cohen understands the captivating power of these two elements. Used alone, fire and water each have their own attractions, but bring them together and the appeal is nearly irresistible.